At Inforum, we got a good sense of the energy, innovation, and ability to evolve that is keeping Infor competitive. 90,000 customers, >15,000 employees (4,700 new employees in past 24 months), Over the past 12 months: 193 new products, 9K new features, hired 1,160 new developers, $800M in R&D development. A core of Infor’s strategy over the years has been to acquire many vertical-focused, ‘venerable’ ERP systems—often systems that were initially created 20, 30, or in some cases 40 years ago. They could have simply milked those as cash cows, but Infor has chosen instead to continually reinvent itself, especially over the past five+ years since Charles Phillips took over. That reinvention process was on full display at Inforum 2016, Infor’s annual conference (colocated with GT Nexus’ annual conference, Bridges). We saw an impressive breadth and depth of initiatives, including their CloudSuite SaaS ERP products and surrounding components (aka CloudSuite Configurations), their GT Nexus acquisition and plans to expand the many-to-many network architecture they acquired to encompass other functionality, their huge investment in retail, the announcement of Infor IoT, and their Cloud CX (Customer Experience) suite. As described in Infor Alchemizing Legacy Solutions, Infor has been investing heavily in the core IP of their legacy platforms and using it as a foundation for building new cloud-based, true SaaS1 ERP systems and complementary applications. 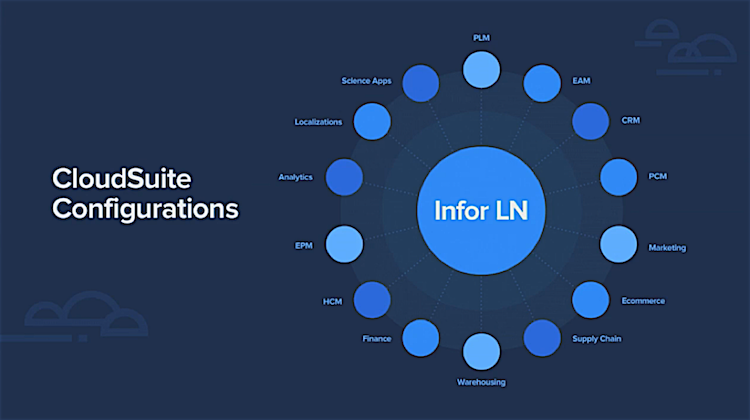 Over the years, Infor has acquired dozens of systems across a very wide spectrum of industries, many focused on micro-vertical-specific functionality. These micro-vertical systems span many different processes and discrete manufacturing sectors, healthcare, hospitality, fashion, retail, public sector, dealers/rental, and more. As a practical matter, trying to create a single ‘superset-ERP’ platform that is configurable enough to encompass all of these industries risks creating overwhelming complexity. 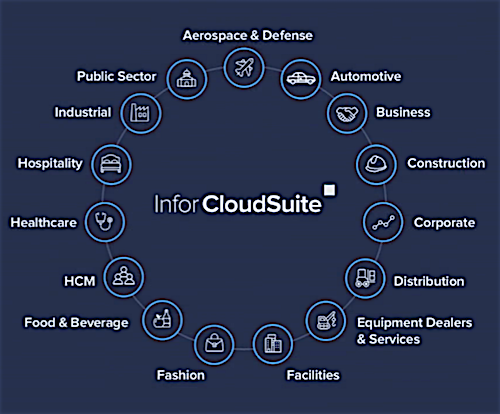 Instead, Infor has opted to create ‘CloudSuite Configurations.’ These are a series of SaaS ERP systems, each addressing specific types of industries. The core applications within each CloudSuite configuration include financials and other mission-critical core functions of the enterprise typically found in an ERP system. These are complemented by what Infor refers to as ‘edge’ applications2 that sit ‘around the edge’ of the core ERP engine. Figure 1 shows an example with Infor’s LN ERP system, which is a work-order-based ERP system, geared toward Engineer-to-Order and Make-to-Order complex product manufacturing industries, such as Aerospace and Defense, and Automotive. These industries need things like complex bid, quote and proposal management, advanced/complex project contract management, mixed mode manufacturing, and so forth. Around the core engine are various edge applications that are horizontal (cross-industry)—for example, the same HCM system is used across all verticals. However, within each CloudSuite Configuration, each of these horizontal edge applications has been specifically configured for each industry—i.e. these are pre-integrated out of the box, pre-tested, configured with industry-specific content, workflows, and KPIs; designed with federated security (aka single sign-on) across these apps, and Master Data Management that harmonizes the data across all the applications. Figure 2 shows the groupings of core-industry-specific applications and the ‘edge’ applications (labelled as ‘best-in-class’ in this illustration), along with foundational services underneath. This approach makes sense as an evolution of Infor existing systems and customers. It allows them to continue to provide deep industry-specific functionality, while also leveraging development of common non-core functionality across all industries. It does create some complexity for us analysts when viewing Infor’s overall portfolio and how things fit together. However, an individual customer can focus in on the single suitable CloudSuite Configuration for their specific business. They have a less complex view and can implement the pieces in an incremental way, based on their existing systems and needs. This approach also provides a good migration path for Infor’s tens of thousands of existing customers, as discussed in our recent article. 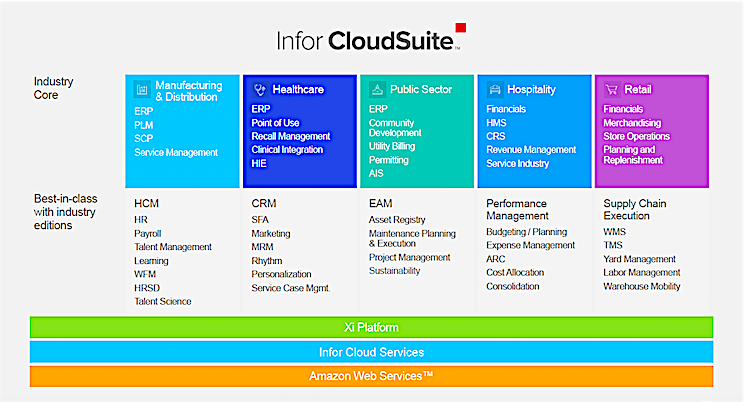 Infor offers CloudSuite Configurations for 15 different industries (Figure 3 ). There is a fundamental architectural difference between Enterprise SaaS (One-to-Many architecture) and Networked SaaS (Many-to-Many architecture), as described in Networked Platforms--Solutions for Multi-Party Inter-Enterprise Processes. Infor’s current set of CloudSuites (like every other SaaS ERP system we’re aware of) are based on an Enterprise SaaS architecture. When Infor acquired GT Nexus last year, one of the big reasons was because it was designed from the ground up with a Networked SaaS architecture (see The Network is Central to Infor’s Strategy). GT Nexus focuses on global procure-to-pay (P2P), logistics, and financing processes, such as supply chain visibility (tracking a PO from creation to payment, including all the shipments and milestones in-between), supply chain finance, transportation management (ocean, air, ground), network inventory management, Procure-to-Pay (P2P) automation, especially factory and partner automation, and more. Infor intends to expand the network functionality and architecture into other areas. One area mentioned by Charles Phillips was ‘end-to-end S&OP,’ with data and players across the chain involved. Charles brought up Kurt Cavano (President, GT Nexus), who described it as a ‘multi-enterprise ERP,’ pulling together all the data outside of the enterprise into a single-version-of-the-truth (SVoT) in the cloud. In fact, Infor is now referring to this GT Nexus+ suite as Collaborative Commerce. 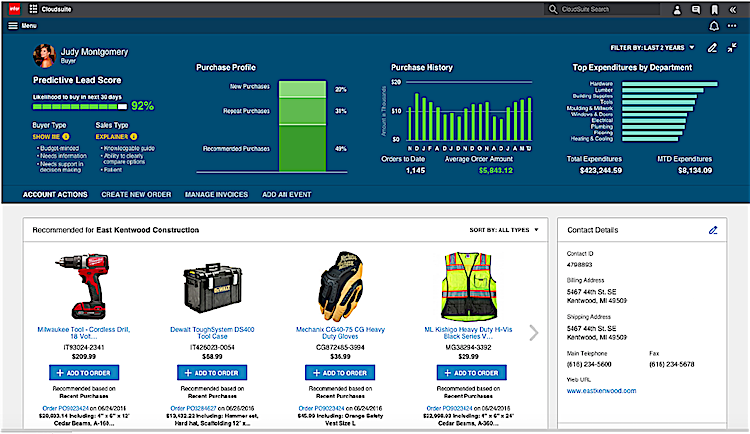 Kurt and Charles showed a screen from Infor’s M3 ERP system that showed a list of orders in a grid on the left and had supply chain information pulled from GT Nexus on the right (such as a map with the location of the currently selected order, as well as status alerts and messages). In the analyst Q&A session with the executive team, I asked if there were other examples of systems Infor is building with a network architecture. Charles Phillips said “it is not only about GT Nexus and logistics/P2P. We believe almost every single task involving external partners could benefit [from inter-enterprise networked systems].” He said Infor’s new retail system (see section on Infor’s Big Retail Investment below) is network-based, with a many-to-many architecture. He said that in discussion with Whole Foods CEO (shortly after closing the GT Nexus acquisition), they brainstormed about ideas such as food traceability, letting consumers know exactly what farm and conditions their food was grown in. Charles added, in talking to Boeing executives, they saw a lot of potential; that with over 200,000 suppliers and a complex multi-tier supply chain, a network could dramatically speed up change orders and other difficult multi-enterprise interactions. He also mentioned healthcare, connecting a patient along the points of care and solving the interoperability challenge between the different providers and services. And asset management for multi-entity service and repair supply chains. So, it sounds like there is no dearth of ideas for new directions for the networked platform. Time will tell us which of these becomes a reality first. Infor has moved all of their other supply chain-related systems and assets under GT Nexus. These include functions such as S&OP, Demand Management, WMS, SCE (supply chain execution, including labor management and 3PL billing), TMS (GT Nexus also already has TMS functionality), APS/IBP,3 and supply planning. There are integrations planned in the near term, such as integrating WMS with GT Nexus, which can be done relatively quickly since the WMS is designed to be integrated with other systems (mostly ERP). Predictix has built a very highly scalable analytic engine for retail, based on their underlying LogicBlox ‘smart database.’ Predictix applies big data machine learning to thorny retail assortment problems, price optimization, forecasting, merchandise planning, category management, and supply chain optimization. From a technology perspective, Infor is integrating Predictix into its retail merchandising development. The transactional system, purchasing, planning, and execution systems, will all be on one architecture. This acquisition helps kick start Infor’s retail platform with a mature set of capabilities. Infor has left the majority of the Predictix team intact, so that product management, engineering, service, and support are still all in the same group, and still reporting up to Predictix CEO and co-founder Molham Aref. For now, they don’t want to mess with the formula that helped Predictix grow 40% last year and on pace to grow 60% this year. At Inforum, Infor announced its acquisition of Starmount. Starmount combines a mobile-first Java-based POS system, with store inventory management, and e-commerce/omni-channel functionality. Among other things, it provides clienteling capabilities for store associates, in-store picking, and a single engine across all channels. Clients include Abercrombie and Fitch, REI, Tractor Supply, Anthropologie, Home Depot, Perry Ellis, Pep Boys, Forever 21, The Container Store, Levis, Burlington Coat Factory, Disney, and others—a quite diverse mix. We hope to take a deeper look at this functionality soon. Pam Murphy, Infor’s COO, announced Infor IoT. She said this initiative has two objectives: 1) leverage Infor’s existing applications, 2) create a scalable and consistent platform (rather than a set of custom products). She said that Infor IoT will commoditize IoT for the enterprise by solving the complexities of connective devices, communications, security, and edge intelligence. Examples given included tracking of assets travelling around the globe and predictive maintenance. In the latter case, Pam described a scenario where vibration and sonic sensors on a conveyor system predict the pending failure of a bearing, causing Ming.le to generate an order in Infor EAM, attaching the analytics and evidence to support the failure. A work order is created and the repair performed, avoiding a costly disruption to the operations. This is another new area that we hope to learn more about. One thing to note is that GT Nexus has had variations on some of these capabilities for a while. For example, for years they have had the capability to monitor an outsourced factory via RFID or other sensors. More recently they introduced ‘precise ETA’ capabilities which combine data from vessels with weather, port congestion, traffic and other data to give a precise ETA prediction. This approach is much more precise than using the ETA estimate from the carrier, which is typically based on average transit times plus a bit of a buffer time added, so that they are more likely to be early than late. Infor has invested over $250M in developing Infor CloudSuite CX, as a set of cross-industry customer experience capabilities. The CX suite includes five major components, as shown in Figure 5. In marketing, it includes customer analytics, collaborative campaign planning, multi-channel campaign execution, and personalization. For the past two years, they were a leader in the Gartner Magic Quadrant for this category. Companies typically have different apps for email, mobile, advertising, etc. Infor is able to centralize it all, which makes it more efficient to personalize and target across more segments and channels. Engagement and Commerce, the online components based on their Rhythm platform, allow users to create personalized online experiences with minimal or no help from IT. Rhythm provides a single selling platform that goes across the website, at checkout, or in the aisle. The Starmount acquisition will become part of these capabilities, accelerating this vision in retail stores. 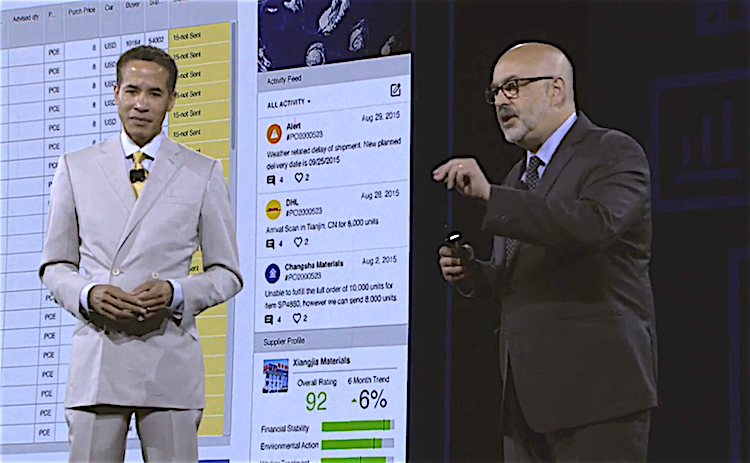 In Sales and Service, Infor already has about 600,000 users on the platform. They claim to ‘easily go head-to-head against Salesforce.com’ on functionality. They have lead-to-order, CPQ (Configure, Price, Quote), gamification, machine learning, and an award-winning UI/UX. It can give guidance to the salesperson, like what the next best offer would be for the person they are speaking to on the phone, with a UI showing recent purchases, purchase profile, and leveraging algorithms developed by Infor’s science lab to predict likelihood to buy. 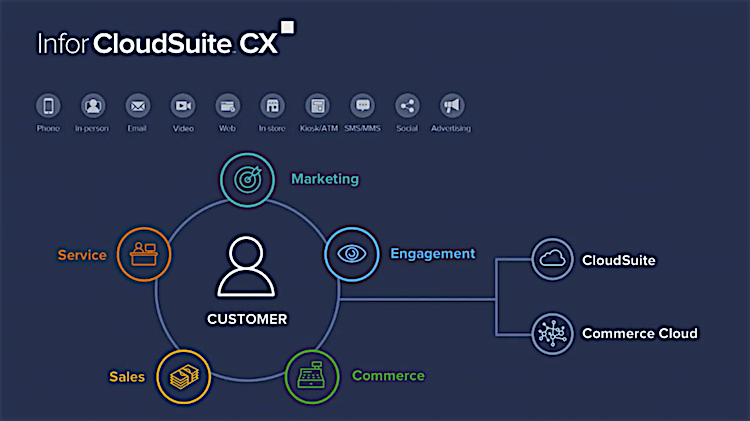 The CX suite is available across industries. At the keynote and at the sessions, we heard from one customer after another, including Travis Perkins’ CEO, John Carter; Triumph Motorcycles’ Chief Design Officer, Geoff Hurst; J.R. Watkins’ IT Director, Scott Iverson; Kirin’s IT Division Manager, Kenji Maeda; Zahid Tractor’s VP Operations, Nasser Bayram; Sanford Health’s VP of Supply Chain Management, Tom Harvieux; and that was just on day one. There were countless other presenters in the breakout session and on the Day 2 sessions at both Inforum and Bridges. At a conference this size, it is impossible to report on even a fraction of everything we learned. However, it was apparent that Infor is so much more than a collection of ERP systems. Of course the work ahead is formidable—with the number of different systems, industries, and capabilities they offer, managing the complexity can be daunting. But they have made tremendous progress on so many fronts and with capabilities like Hook & Loop, GT Nexus, Predictix, and so much more, they truly have a unique combination of offerings and competencies that helps explain why they have 90,000 loyal customers and growing, with what looks like a bright future ahead.